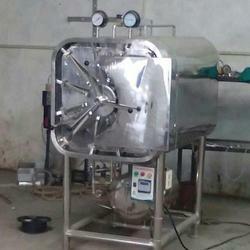 We are one of the leading supplier & manufacturer of Autoclave. Our product range also comprises of Incinerator, Hot Air Heaters. We are a manufacturer, supplier & dealer of Portable Autoclave. We manufacture a wide range of Portable Autoclaves that is appropriate for any organization/institutes/laboratory, engaged in bulk sterilization and research work. Our product range is strictly tested & equipped with durable molded Neoprene/Silicon gasket. Generally autoclaves use dry heat, boiling water, free flowing steam, pressurized steam and gas & filtration methods of sterilization amongst which pressurized steam sterilization is the most unanimously used method. It is hydraulic tested up to 40 PSI and the entire unit is supplied with Tripod stand and further fitted with heating element to work on 220 Volts A.C.
Fitted with pressure gauge upto 20 psi. Autoclave is hydraulically tested upto 30 psi. Suitable to work on 220/230 Volts, AC supply. 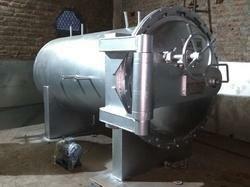 We offer a wide range of Stainless Steel Autoclave.